Pervasive Displays (PDi), a world leader in e-paper displays, today announced the launch of a new high resolution three color 12-inch Electronic Paper Display (EPD) module featuring an internal timing controller (iTC), the E2B98FS081. 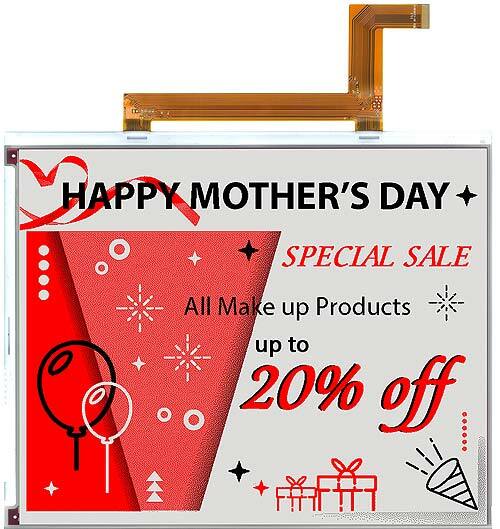 ( http://www.pervasivedisplays.com/products/122 ) The energy efficient, multi-colored display is a good fit for retail ESL (electronic shelf labeling), Point of Sale, office automation, and healthcare market applications. The E2B98FS081 is a 12-inch active matrix TFT three-pigment (black, white, and red), E Ink display panel. With a resolution of 103dpi, the display shows crisp, clear graphics and text. As E Ink replicates the optical characteristics of ink and paper, the EPD can be read clearly in ambient light without a backlight, or in direct sunlight, unlike traditional LCD displays. With three color options, the E2B98FS081 can create eye catching informational displays, with colors being used to highlight critical information, product features, or promotions. As a bistable display, the EPD module requires very little power to update an image and can maintain an image without power. Depending on the application, this means the E2B98FS081 can operate for days, weeks or even months on a single charge. The highly integrated E2B98FS081 incorporates many features onboard which help reduce development time as well as cut BOM costs. Whereas many other EPDs rely on external timing controllers, the E2B98FS081 integrates a Chip-on-Glass timing controller on the display itself, along with a booster circuit to reduce the need for external components. The timing controller stores pre-programmed driving waveforms tuned by Pervasive Displays to provide high performance operation of the EPD. Besides providing strong, reliable optical performance and low energy consumption, the stored waveforms also greatly simplify display development and operation. The high level of integration, thin profile and low power consumption features allow the E2B98FS081 to be used in very small or thin form factors, and in applications without the energy budget for a traditional display.